A good way to use up excess fruit is by drying fruit leather. This page contains fruit leather recipes. 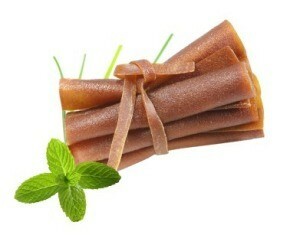 I am looking for some good recipes for making fruit leather. Any tips or recipes would be greatly appreciated. I have never done it before. When making friut leather, do not use regular sugar to sweeten with. Regular sugar leaves you with a sticky friut leather. Rather, use honey. For example, to 12 kiwi (pureed) add 2 1/2 T. honey. A little lemon juice to the puree will keep the friut leather from turning brown as quickly. Some fruit combinations...apples and raspberries, strawberries or any other friut..... raspberries and blueberries....etc. 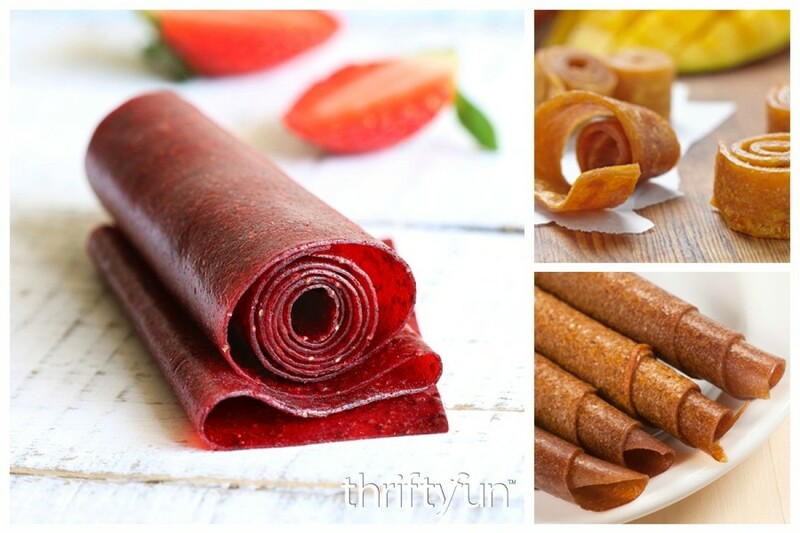 Homemade fruit leather is really good. Puree the fruit, add a little liquid honey to sweeten and lay on your trays, 1/8-1/4" thick and dry overnight in your dehydrator. Once dry, peel off and roll in a plastic wrap and place in an airtight ziploc bag. Good for years. Optional...freezing but I never do. Just cut with scissors later when you send pieces to school with the kids, or tear off a piece for yourself. Dried fruit, eg. homedried slices of bananas will make you wonder what they have done to the dried bananas that you buy in the store...sure not anything like the real thing. I just dip the 1/4" fruit slices in a little lemon juice and dry. Apples, peaches, apricots, bananas and kiwi are all good as dried pieces. Have fun experimenting. My kids loved taking them to school in little bags. They certainly ate more fruit that way. Has anybody tried making fig fruit leather? My mother did it every year until our fig tree died. It was the only way some of us would eat figs. She cleaned the figs and peeled them, put them into the blender until they were soupy. Then spread them out thinly on plastic wrap in cookie sheets. If she put them outside to dry, she would cover the cookie sheet with cheesecloth held in place by pinching-type of clothes pins. (In Arizona, that is the most effecient way) She would roll up the plastic wrap along with the fig leather and store it that way until we used it. Homemade is better than any kind of store bought "imitation flavored" leather. Thanks, I went ahead and made some but I just stemmed, washed and pureed the figs. I rolled the leather in wax paper and cut into 2" pieces for snacking and vacuum sealed in mason jars. Why would you need to peel them? You can save money and control the ingredients used by making your own fruit rollups. This page contains homemade fruit roll up recipes.